Such a fantastic story. I read the entire trilogy back-to-back (during May 2016), and thoroughly enjoyed it. There have been times when I've done this with other trilogies or series and sometimes this would produced a story fatigue. I'm sure you know what I'm talking about this is where reading starts to become a chore, and you end up ploughing through just wanting to see how it all wraps up. Or alternatively you need to put it down for a while, which means you may not pick it up for some time. Not with this story. It was compelling and Stephen changed point of view enough to keep it fresh and had you wanting to read more. There are some really nasty characters in this story, characters that really had my blood boiling. Character development is a strength of Stephen's, he creates people who you love and others who you loath, but there were not any main characters in this story that I felt indifferent about. I appreciated seeing the major characters grow and change, none of them stayed black and white or two dimensional, and Stephen made them feel like real people. In this I mean they weren't all evil or all good, but each following his or her own path between both, some struggling with the decisions they made, others sure of themselves but all experiencing the consequences of their actions and also seeing how these consequences affected other characters in the story. I really enjoyed following the journey and subsequent character development of Duncan and Carter and it was good to see them both different at the end of the story. This gave the story an element of realism unlike some books you read where the bully is always the bully, the good guy is always the good guy and they never learn or change during their journey. There was something about the characters of Prince Owen and Willow which I really liked, but due to the fact I hand-wrote my notes over a year ago, after completing the trilogy, I really couldn't work out what my handwriting said. Something else you don't normally see in adventure type stories like this is after the 'happily ever after'. I was interesting to see the story continue after several main characters return home. They had just endured a traumatic life changing event but instead of a heroes welcome they are treated at best, as if nothing ever happened and expected to keep the status quo and, at worst, they are treated with contempt, thought of as deceivers and people to be shunned. World building is where Stephen Hunt excels and Pelas, the world they inhabit, is one big world where metal is scarce. This is a key point in the story. At one point in the book its casually mentioned that it took one million years for a radio signal to circumnavigate the world of Pelas, so it is one very large world. Most of the characters live in cultures ranging between a prehistoric culture (wondering rampaging nomads) to a postindustrial culture (Edwardian / Victorian Steampunk), only a small percentage become highly advanced. Unlike other authors who sometimes feel the need to provide a detailed explanation of the world in which their story is set, Hunt doesn't. Constant clues about the nature of the world these characters inhabit are scattered throughout the narrative but its never fully revealed, only the vastness of it. The rest of the time we have to scrap together what we're given and try to extrapolate the nature of this world. Only right at the end of the third book, are we given a brief explanation about the history of Pelas, but still not what it is, and it's also revealed why metal is so scarce. There is also a twist which changes your view of the whole story. I love it. it's such a great series to read if you like science fiction, fantasy, steampunk and westerns. 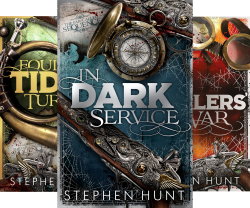 Stephen Hunt is one of my favourite authors. If you want to read more of his books, I'd recommend The Jackelian World series which is a fantasy steampunk world which includes magic in various forms and where steam power, rather than oil, drives the economy. And for the science fiction reader who wants more space ships and open space, check out The Sliding Void Series. There is also two other articles here on my blog which deal with Stephen Hunt and his work. Carter has been kidnapped. Enslaved. But he's determined to fight to the end. Jacob is a pacifist. His family destroyed. He's about to choose the path of violence to reclaim his son. Their world has changed for ever. Between them, they're going to avenge it. Jacob Carnehan has settled down. He's living a comfortable, quiet life, obeying the law and minding his own business while raising his son Carter ... on those occasions when he isn't having to bail him out of one scrape or another. His days of adventure are - thankfully - long behind him. Carter Carnehan is going out of his mind with boredom. He's bored by his humdrum life, frustrated that his father won't live a little, and longs for the bright lights and excitement of anywhere-but-here. He's longing for an opportunity to escape, and test himself against whatever the world has to offer. Carter is going to get his opportunity. He's caught up in a village fight, kidnapped by slavers and, before he knows it, is swept to another land. A lowly slave, surrounded by technology he doesn't understand, his wish has come true: it's him vs. the world. He can try to escape, he can try to lead his fellow slaves, or he can accept the inevitable and try to make the most of the short, brutal existence remaining to him. ... unless Jacob gets to him first and, no matter the odds, he intends to. No one kidnaps his son and gets away with it - and if it come to it, he'll force Kings to help him on his way, he'll fight, steal, blackmail and betray his friends in the name of bringing Carter home.